At the beautiful crossroads of US-131 and US-10, we welcome you to Reed City. We are a bustling community located at the heart of Michigan. Reed City is also a major crossroads for Michigan's popular Rails-to Trails system. Here, the state's premier trails intersect; the White Pine Trail (running north and south) and the Pere Marquette Trail (east and west). This unique crossing makes us one of Michigan's most important trail communities. 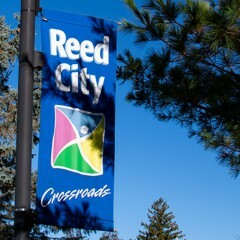 With a friendly home town atmosphere, Reed City invites you to visit, work, and raise your family. We have a vibrant downtown and offer many business opportunities. With our beautiful parks, trails and abundant natural beauty, Reed City is the perfect place to camp and enjoy Michigan's outdoors. In every season, Reed City is your place for outdoor adventure. Please browse here for more information about Reed City, our Chamber of Commerce, business opportunities, and tourist attractions. Thank you for your interest in Reed City. In our 21st century economy, innovation is necessary for economic leadership. Broadband infrastructure is today's central platform, and faster speeds spur innovation. The City of Reed City is pleased to be part of a fiber-optic expansion area of Internet services being built now by Casair, Inc. Casair is constructing 400 miles of 10GigE fiber to connect its tower locations, creating massive amounts of bandwidth for our area. This new higher level of connectivity is great news for businesses and entrepreneurs who want to grow and expand in Reed City. It means a faster broadband network, offering area homes and businesses access to gigabit broadband, bringing supercomputing power to local Internet users. Exciting things are happening at your Reed City Area Chamber of Commerce. Check out our April newsletter at the link below. Join the action on our Reed City Area Chamber Facebook page. Chamber Member of the Month, Reed City Area District Library! We are honored to be selected as Chamber member of the month! While we have a chance to brag a bit about your library, first, we would like to convey our gratitude to all Chamber members and business leaders for their support of our programs. Your library is truly a hive of activity as we march into Spring. We are proud to announce that our new computing center will open May 1st. Through a generous private donation, the interior space will be completely upgraded. Featuring 10 custom fabricated steel desks with Amish built maple tops. New professional seating for 10 stations complete with individual USB/AC power ports. Our future plan includes high-speed fiber broadband connectivity and new hardware. Looking ahead to June, A Universe of Stories is our Summer Reading Program theme. Stay tuned for details about our space-based events and activities. Lastly, if you haven’t heard, the Smithsonian is coming to Reed City for 6 weeks beginning February 1, 2020. Your library is proud to host the exhibit titled, Crossroads: Change in Rural America which will debut at the Depot. We look forward to a community-wide celebration showcasing our history and envisioning our future. Please visit www.reedcitylibrary.com to learn how you can get involved. Trinity Lutheran Church is proud to lead the inaugural Refresh Reed City on Saturday, April 27. Refresh Reed City is an opportunity for all citizens and businesses to come together and help spruce up our wonderful community after this long, hard winter. We would like to welcome your organization in helping make Refresh Reed City a successful event. Our goal is to have Reed City looking sharp for the Wheatlake Festival of Races on Saturday, May 18, our awesome Memorial Day Parade on Monday, May 27, and the summer of 2019. If other groups would like to participate, please contact City Hall at 231-832-2245 and they will pass it along to the organizers. For more information, please click on the link provided below. Your Bike and Hike Camping Adventure Begins In Reed City. Looking for a Bike Hike Camping adventure out on the Michigan Trails? Come to Reed City, Michigan's Crossroads. Reed City is where two of Michigan's mightiest trails intersect, the White Pine Trail running north and south, and the Pere Marquette Trail heading east and west. Reed City is the perfect place for your adventure to begin and end. Rambadt Park is a cozy campground nestled in nature close to US 10 & US 131 and the White Pine and Pere Marquette Trails. 13 campsites offer electricity and water hookups. Reservations are accepted. You will find warm showers, a pavilion, band shell, walking trail and kids playground. Open mid-May to end of October. There are free concerts in the park every Friday and Saturday, June to August. From there, which direction to head on the Pere Marquette or White Pine trails? Any is a good choice! 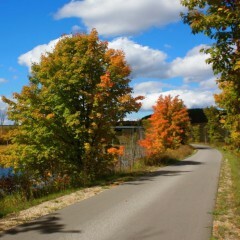 Check this article about the White Pine Trail, Reed City to Cadillac from Michigan Trails Magazine for starters. While you are in Reed City, enjoy our restaurants and downtown shops, all eager to please you with their selection and service. Find out why Reed City is a popular destination to base a day or weeklong adventure on the Michigan Trails.